The Traction Motor Test Set features separate internal sources for field and armature testing and an AC source for testing winding reactance (Impedance Test.) 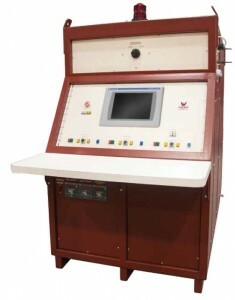 The output supplies each have separate controls, measuring and protection circuits for efficient use of the test set. The test system has a complete instrumentation package for definitive measurement of electrical and physical characteristics of motors under test. All meters for AC and DC supplies are digital and displayed on the Human Machine Interface. High accuracy current transformers (CT) and transducers are utilized for stability and a high degree of meter accuracy. All meters are calibrated with standards traceable to NIST/NRC and a calibration sticker is affixed to the Control panel faceplate.